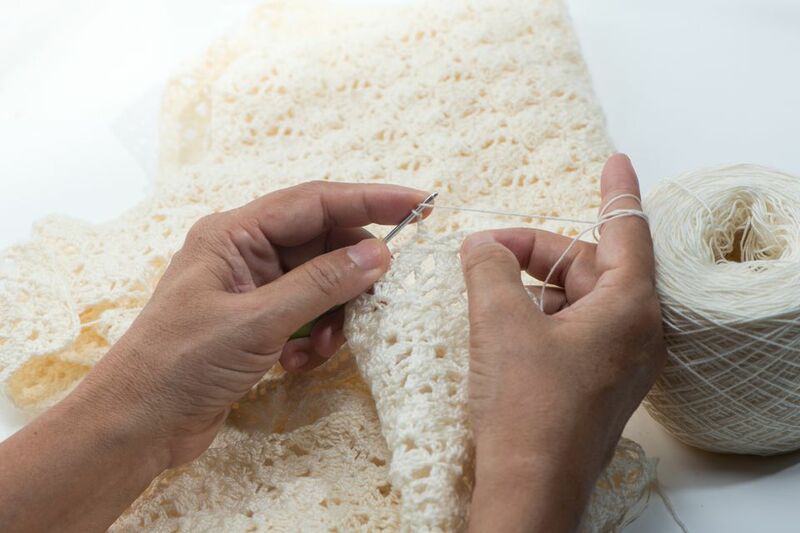 Left-handed crochet is as common as the number of people who are naturally left-handed. In spite of this, most crochet instructions are written for right-handed crafters. As a leftie, it can feel like the craft world has left you out. Luckily, that's changing, thanks to a number of motivated designers who have created tutorials and patterns for left-handed crafters. Even without those resources, though, it doesn't have to be difficult to learn how to crochet left-handed. The following resources and tips will get you started. The first thing you need to know is that everyone crochets a little differently. So, there is no one "correct" way of doing it; there are many possible variations of correct when it comes to crochet. This is true whether or not you are left-handed. One of the things that people do differently when learning how to crochet is that they hold their crochet hook a certain way. People often use either a "knife grip" or a "pencil grip" but may have their own variations of either one. Left-handed crocheters are no more likely to use one type of grip over the other in comparison with right-handed crocheters. What Makes Left-Handed Crochet "Different"
The only real difference between left-handed and right-handed crochet is what hand you hold the hook in and which direction you work a row. In right-handed crochet, the hook is held in the right hand. With a few exceptions for specific niches of crochet, the right-handed crafter works stitches from the right to the left. In left-handed crochet, it's the exact opposite: hold the hook in the left hand and work the stitches from left to right. Follow left-handed crochet tutorials. These are readily available online and include both written tutorials with photos and video tutorials. Many people prefer video tutorials when first learning crochet. Have a left-handed crafter teach you. Ask at your local craft store if there is a crochet teacher who is available to teach a left-handed crafter. Sit opposite a right-handed crochet teacher. This will allow you to follow what (s)he is doing while working as the mirror image using your left hand. Learn to crochet right-handed. This used to be the only option. It's not a top choice for most people, but it's an option. If you're ambidextrous or find that you can easily crochet right-handed even though you're a lefty then it's always an option to just learn "regular" crochet. It is worth noting that you will be using both hands in crochet regardless of which hand holds the hook. The dominant hand typically holds the hook, but the non-dominant hand stays busy working the yarn and holding the work-in-progress. When working with written crochet patterns, you don't need to do anything differently as a left-handed crochet. However, when you are working from crochet graphs and charts, you will want to reverse the image before beginning crochet. If you don't, then your left-handed crochet work will have an image that is the opposite of intended. That can be okay with symmetrical images but doesn't work for words and asymmetrical images. As a teacher, you can adapt your own crochet style to other-handed crafters. As mentioned before, one option is to sit across from the crafter so that they can mirror your style. You may also wish to create crochet video tutorials, and you can use video editing software to actually horizontally flip the image in order to create a left-handed crochet tutorial from your right-handed crochet video. Ultimate Guide to Left-Handed Crochet. This is a complete set of "how to crochet" instructions written for left-handed crafters. You will learn the basic stitches and photos are included showing what the stitches look like as you craft with your left hand. Beginner's Guide to Left-Handed Crochet. This instructional guide from Moogly shows the basic stitches in both written language and with videos. Left-Handed Crochet Videos from The Crochet Crowd. This YouTube channel is entirely designed for people who crochet left-handed. There are stitch tutorials for people who are just learning to crochet as well as left-handed crochet pattern videos.